Back in November I wrote a post called "How to Wear a Satin Bonnet in Public" and the key to that conundrum was that you don't actually have the bonnet visible. Many women seemed to have missed the memo because I'm constantly inundated with obscene sights of bonnets in daylight, in public. It's a mess. 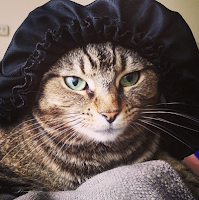 So, hoping to shed some light on this major issue, my beautiful tabbycat Misty wanted to show ladies how to truly rock a satin bonnet - - at home. And if you do need a real refresher, visit my post and take note that there's nothing better than throwing a beanie over your satin bonnet. I get that you might be "saving" your hairstyle for a special event (which isn't running to the grocery store), but taking the extra effort to look more "done up" with your satin bonnet in public is much appreciated. As you can see in the picture to the right, I have no issues rocking a beanie... and guess what? My satin bonnet was under there! What do you know! It's actually possible to be in public, hair protected, and still look good. *snaps for the kid* lol... but seriously, I'm always throwing on my bonnet and beanie if I want my hair to air dry, or even let my flat twists "set" for going out later... just cover up that wretched bonnet. It kills my eyes.